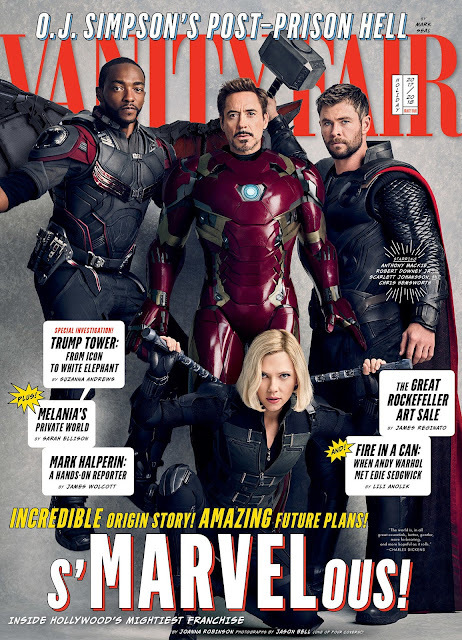 See the cast of Avengers: Infinity War on these hi-res Vanity Fair magazine covers. 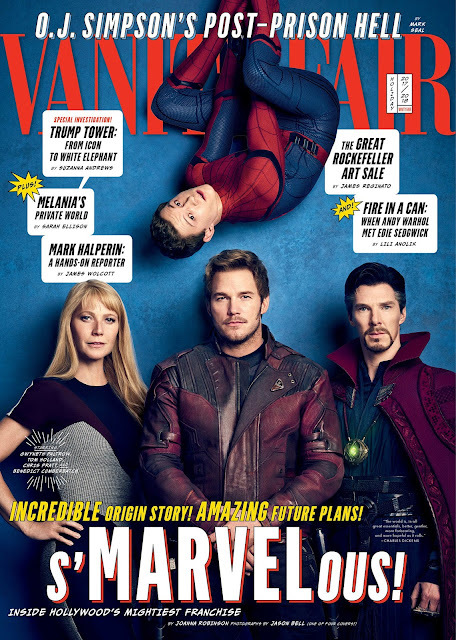 As part of their article "Secrets of the Marvel Universe" covering Kevin Feige and the rise of Marvel Studios, Vanity Fair released a series of covers that celebrate the upcoming Marvel team-up movie Avengers: Infinity War. The looks are familiar with a few differences. Chadwick Boseman and Paul Rudd have their new suits from their new upcoming movies Black Panther and Ant-Man and the Wasp respectively. 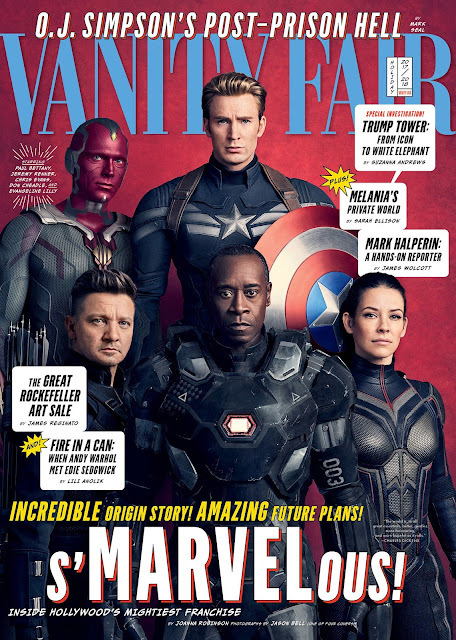 Chris Evans is wearing his Captain America suit from Civil War and Jeremy Renner is wearing a new Black suit from Infinity War. Evangeline Lily is wearing her new Wasp outfit. Tom Holland is wearing the Spider-Man Homecoming suit instead of the Iron Spider suit teased at the end of the movie. The Holiday issue of Vanity Fair will be on newsstands in New York and Los Angeles on November 29, and nationally on December 5. To get all four of the covers you can buy each individually or subscribe to "The Collection" which collects "all four limited-edition Marvel covers, photographed by Jason Bell, and get one year subscription to Vanity Fair for just $30. Plus, you’ll receive a free tote!" Not a bad deal considering each issue is almost $4 apiece. 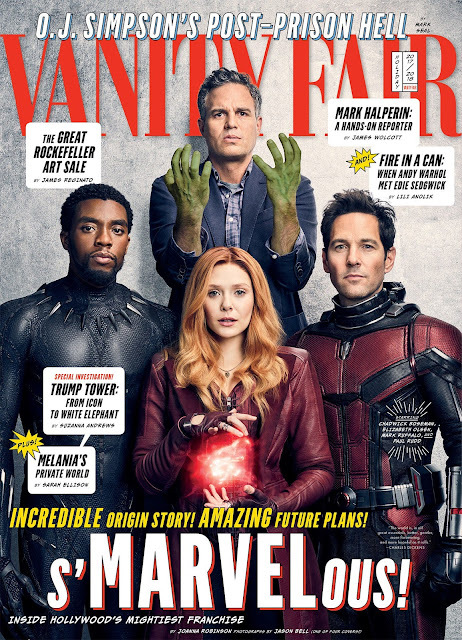 Of course, you have to really like Vanity Fair. Otherwise, I'd just buy my favorite. Check back for more news, updates, and rumors for Marvel’s Avengers: Infinity War from the Geek Twins!